As an independent, nonprofit educational organization, we are entirely run by volunteers. 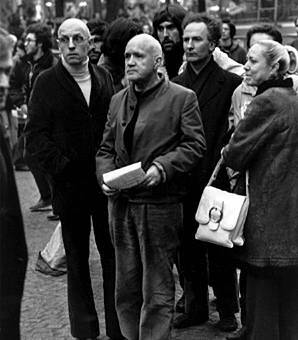 We welcome anyone who would like to help us plan and organize Foucault Society events and programs. Program Committee: Committee members will decide on the topic and format of programs, invite scholars to present their research, write calls for papers and/or program descriptions for grant proposals, and work out logistics for events (including location and publicity). This is a great opportunity to think creatively about current Foucault research, to meet other people doing work in this field, and build up the “service” part of your c.v. Event Management: Contribute to publicity, registration, set-up and other event logistics for our colloquium series and reading group. NEW–Tech Volunteers Wanted: If you can attend our events in NYC and would like to record, video or live-stream our programs to put on the web, please get in touch. We get so many requests from our supporters in other cities, but we don’t have the staff to do this right now. We’d love to talk to anyone who is here in NYC and has the expertise to help us out. Fundraising and Membership Outreach: Help develop the Foucault Society into the future. If you have development and/or outreach ideas, this is a great opportunity to take a leadership role. For this position, you do not need to be in the NYC area. Website Content Editor: Update the Bibliography and Research Community sections of the Foucault Society website. Add recently published books and articles to Bibliography page. Update our listings of current calls for papers, conferences, lectures, etc. Develop website content in collaboration with Director of Communications and other board members. New ideas welcome. For this position, you do not need to live in the NYC area and you do not need to have experience in web design. Graphic Designer and Web Designer: Create posters, brochures and other publicity materials. Help us update the Foucault Society logo. Collaborate on redesign of Foucault Society website using WordPress.com templates. For website work, you do not need to know HTML. Familiarity with CSS is an asset, but not absolutely necessary. Design volunteers will work closely with Director of Communications. Interested? Send us an email and we’ll set up a time to talk. To give us a better idea of your skills and interests, you can also get things started with the Foucault Society Volunteer Application, downloadable here. Please note: Committee members should be able to commit two hours a week to volunteer work. Have other ideas? Let us know what you’d like to do. All energetic, enthusiastic, creative people are welcome.